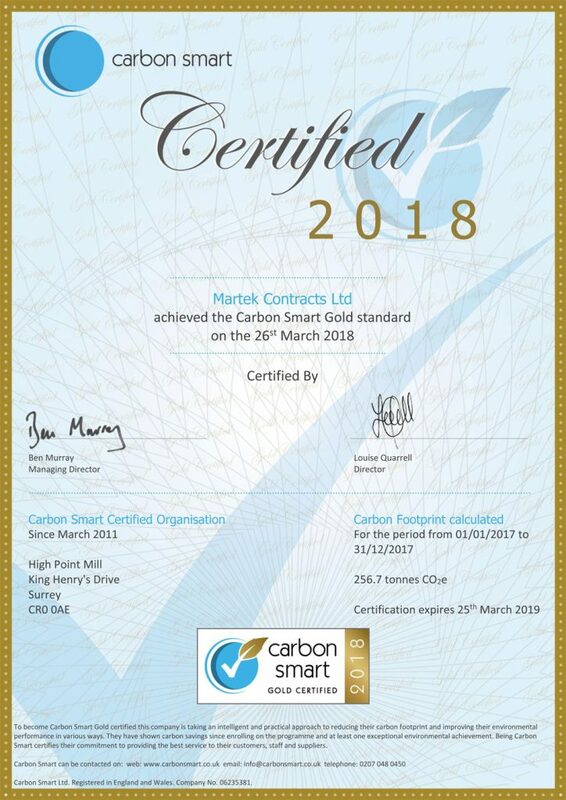 Martek | We are thrilled to have been certified with Carbon Smart Gold. We are thrilled to have been certified with Carbon Smart Gold. To take a proactive stance and address our contribution to climate change, we have committed to the Carbon Smart Programme. Being Carbon Smart means taking an intelligent and flexible approach to reducing our carbon footprint. Our carbon Smart Certification demonstrates the practical actions we have taken to actively reduce our environmental impact. It clearly demonstrates our commitment to customers, staff and suppliers. Just like recycling, the Carbon Smart Certification makes improving our environmental performance part of the every day running of our business. We would like to extend a special thanks to Linda Goldsmith who has pioneered our Carbon Smart accreditation. We first became certified with blue in 2011, we then achieved silver status in 2016 and following our most recent annual assessment last month, now hold Gold status. Click here to find out more about the scheme.